"How to cook pasta ahead of time." Bring a large pot of lightly salted water to a boil. Add pasta and cook for 5 to 7 minutes or until still slightly less than al dente; drain. Rinse with cold water. Toss with olive oil. Cover and refrigerate until ready to use. 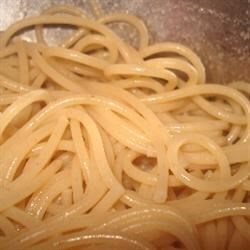 To reheat, bring a large pot of water to a boil, add pasta and cook until hot, 1 to 2 minutes. This is a great way to save time when you need a quick meal. However, you can use a lot less oil than the recipe calls for. Also, I freeze the pasta for future meals. It comes out great!!! I agree, may as well cook fresh. Someone told me to just put your frozen or cold pasta in a colendar, boil water in the kettle and pour it over. Works like a charm and it steaming hot. I do this when I have a dinner party and I make Bowtie Pasta with Chicken in Asiago cream sauce. Works fantastic! This is a GREAT idea, especially for "cooking for one or two" or different shifts. Excellent tip. THANKYOU!